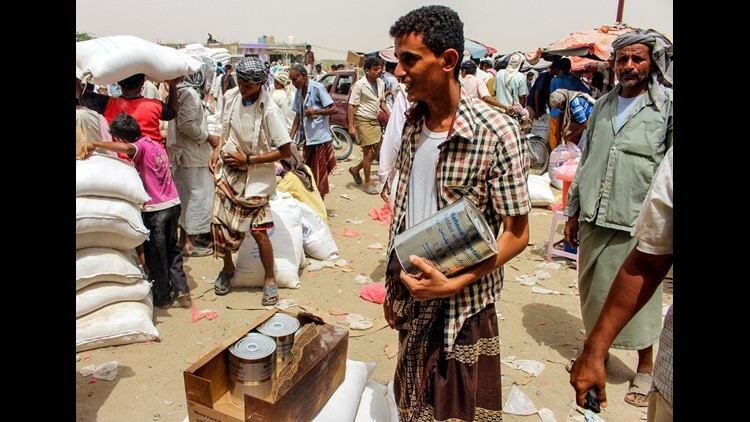 Yemeni civilians receive food aid for displaced people who fled battles in the Red Sea province of Hodeida and are now living in camps under control by the Iranian-backed Huthi rebels in Hajjah on June 24, 2018. WASHINGTON – Lawmakers in both parties are increasingly alarmed by America’s support for a bombing campaign in Yemen that has left thousands of civilians dead – including 40 children who were killed last month when an airstrike hit a school bus. “These certifications are a farce, and we should all be ashamed that our government is turning a blind eye to likely war crimes,” Murphy said. The State Department did not publicly release the certification sent to Congress. Pompeo said the U.S. is working to ensure that Saudi Arabia and the UAE support efforts to end the war, and in the meantime, that the coalition allows humanitarian support to reach those in need and mitigates the impact of the conflict on civilians and civilian infrastructure. But others said the civilian casualties and a severe humanitarian crisis in Yemen is getting worse, not better. “The civil war in Yemen has been raging for more than three years and has created the world’s worst humanitarian crisis,” Sens. Jeanne Shaheen, D-N.H., and Todd Young, R-Ind., wrote in a joint op-ed published Tuesday by The Washington Post. They noted that three-quarters of Yemen’s population – about 22 million people – need humanitarian assistance. Of those, 8 million are on the brink of starvation, and 400,000 children are suffering from severe malnutrition. “A major contributor to the devastation and chaos is the indiscriminate bombing campaign led by a coalition made up of Saudi Arabia and the United Arab Emirates, which receives refueling, intelligence and targeting support from the United States,” the two senators wrote. A Sept. 5 report by the United Nation’s human rights office found that since March 2015, at least 5,144 civilians have been killed in Yemen and more than 8,749 injured. Children accounted for 1,184 of those killed and 1,592 of the injured, the U.N. report said. “Coalition airstrikes continued to be the leading cause of child casualties as well as overall civilian casualties,” the U.N. concluded. Shaheen said Wednesday’s certification from the State Department did not meet the demands from Congress, which required the agency to provide evidence that the Saudi-led coalition has taken steps to end the war, alleviate the humanitarian crisis and protect civilians. The Yemeni conflict is essentially a proxy war between Iran and Saudi Arabia, as they compete for power and influence in the region. The civil war began three years ago when Houthi Shiite rebels, backed by Iran, overthrew President Abed-Rabbo Mansour Hadi's government. A Saudi-led coalition, backed by the U.S., launched a military campaign against the Houthis soon after. Iran is an arch-rival of Saudi Arabia, which has a Sunni majority.